What is the most important information I should know about nelfinavir? You should not use nelfinavir if you have moderate to severe liver disease. Serious drug interactions can occur when certain medicines are used together with nelfinavir. Tell each of your healthcare providers about all medicines you use now, and any medicine you start or stop using. Nelfinavir is an antiviral medicine that prevents human immunodeficiency virus (HIV) from multiplying in your body. 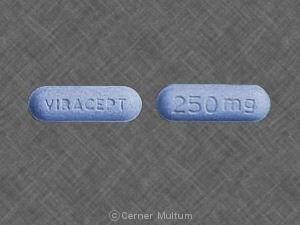 Nelfinavir is used to treat HIV, the virus that can cause acquired immunodeficiency syndrome (AIDS). Nelfinavir is not a cure for HIV or AIDS. Nelfinavir may also be used for purposes not listed in this medication guide. What should I discuss with my healthcare provider before taking nelfinavir? You should not take this medication if you are allergic to nelfinavir, or if you have moderate or severe liver disease. This medication is not expected to be harmful to an unborn baby, but HIV can be passed to your baby if you are not properly treated during pregnancy. Tell your doctor if you are pregnant or plan to become pregnant. Take all of your HIV medicines as directed to control your infection. If you are pregnant, your name may be listed on a pregnancy registry. This is to track the outcome of the pregnancy and to evaluate any effects of nelfinavir on the baby. Nelfinavir can make birth control pills less effective. Ask your doctor about using non hormonal birth control (condom, diaphragm with spermicide) to prevent pregnancy. You should not breast-feed while you are using nelfinavir. Women with HIV or AIDS should not breast-feed at all. Even if your baby is born without HIV, you may still pass the virus to the baby in your breast milk. Nelfinavir is not approved for use by anyone younger than 2 years old. How should I take nelfinavir? Nelfinavir works best if you take it with food. Swallow the nelfinavir tablet whole. If you cannot swallow a whole tablet, dissolve it in a small amount of water. Stir this mixture and drink all of it right away. To make sure you get the entire dose, add a little more water to the same glass, swirl gently and drink right away. If a child is using this medicine, tell your doctor if the child has any changes in weight. Nelfinavir doses are based on weight in children, and any changes may affect your child's dose. Use nelfinavir regularly to get the most benefit. Get your prescription refilled before you run out of medicine completely. While using nelfinavir, you may need frequent blood tests. What should I avoid while taking nelfinavir? If you also take didanosine, take it 1 hour before or 2 hours after you take nelfinavir. What are the possible side effects of nelfinavir? What other drugs will affect nelfinavir? This list is not complete and many other drugs can interact with nelfinavir. This includes prescription and over-the-counter medicines, vitamins, and herbal products. Give a list of all your medicines to any healthcare provider who treats you. Your pharmacist can provide more information about nelfinavir. Copyright 1996-2017 Cerner Multum, Inc. Version: 14.02. Revision date: 5/13/2016.